Our film and video class was a very tight knit group of hell raisers (we just found out one professor, Peter O’Neill dubbed us “the class from hell”). We scoffed at “the man” who was always trying to bring us down. 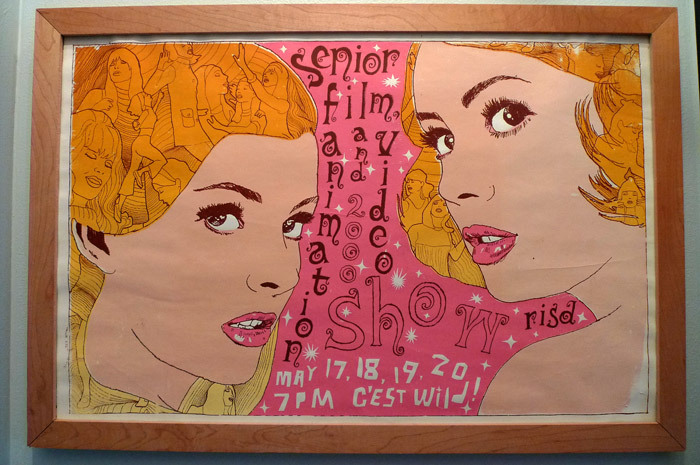 One example was our Senior Show, the poster for which a member of the class usually designed. For our year they decided instead to give the honor to a grumpy secretary who didn’t like any of us. The result was unmemorable. We, of course, made our own poster anyways and this is it. Our extremely talented friend Tim Lokiec is the artist. I adore!! Want More Film Stills,The Arts,Yearbook Club? I too love that poster!